Numbers are from the Census Bureau's American Community Survey 2011, 3-year estimates. The categories we used are mostly from the marketing report linked above (which is somehow connected to Richmond, Virginia, another apparently "average" city). One category -- income -- is a bit different because we didn't have access to the same metric they used (we used general household income instead of a number adjusted for taxes). We also added a few categories to fill out the picture. + We marked the categories where Albany differed from the United States by more than one percent -- that's an arbitrary designation, but it seemed like if we're going for extraordinarily "average," it was an OK mark to use. + You could define "average" (or not average) a lot of different ways. And you could probably make a pretty good argument that even if the Albany metro is demographically very similar to the country as a whole, it's unusual because of it's geographic and political structure. + We suspect sophisticated market research goes beyond simple census data like this and looks at psychographic factors for areas -- stuff like whether people are willing take a chance on something new. + Apparently one of the good things about a metro being average is that it makes a good test market for new stuff. But off the top of our heads, we can't really think of too much stuff that we get first here. In fact, when it comes to chain stuff, it always seems like people are clamoring for something everywhere else has. + Peoria, Illinois was once the "average" capital of the country, thanks in part to Vaudeville. + It's a little bit older than the rest of the country. + It's less ethnically diverse than average. + Its households tend to make more money, and people have more education. + Its households are a bit smaller, women tend to have fewer children, and it has has more people who live alone. I've wondered about this over the years. Thanks for crunching the numbers. I wonder what would happen if they re-ran the test today. My bet is we'd be out of the top ten just based on those racial numbers. If this is the bourgeois capital of the USA, then why do 3 former members of the Weathermen all still live here? Albany is the place where dreams come to die. I remember hearing the same thing as a kid in the 70s, as an explanation for why we were always getting bags with product samples and coupons hung on the front door. Dad would say "we're a test market," mom would say "if we weren't home, the thieves would know right where to go!" Meanwhile, we never had to buy shampoo, it always magically appeared. @Ryan: I suspect that, too. My initial skepticism to the claim was prompted by the fact that the American population has diversified significantly over the last few decades, in large part because of the growing Latino population. And the Capital Region's Latino population is relatively small compared to the percentage of the nation as a whole. 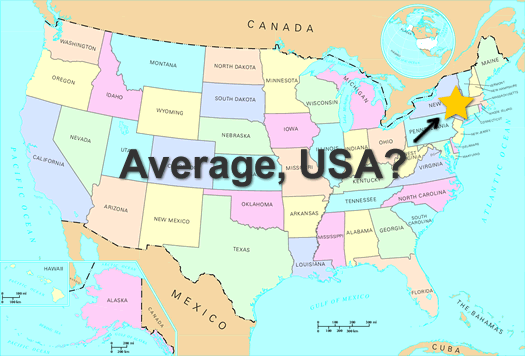 I think the negative issue is with the word 'average' - we are a classic American city. We can out-America everywhere else in America! That is a strange assertion. I always sensed Albany as a place that had many older people in it, even growing up in the 1960s. That was the city my grandmother lived in, and it was SO Art-Deco in those days. Even now, I sense that it has an older population. But maybe Albany is more of a leader that way, as this country ages. Anyway, compared to Binghamton or other Upstate cities, Albany seems vibrant, especially with its arts and cosplay scenes. Typically American? No.